When the Giants schedule came out in April, Week 9 was circled for a number of different reasons. First, the Giants and Steelers are storied franchises owned by families who have been overseeing their respective teams since before World War II. Second, both teams have been in the top half of the league for the past 8 seasons, combining to win 4 of the last 7 Super Bowls. Third, given their place in opposite conferences and the layout of the NFL schedule, the two teams meet just once every four years (unless they meet in a Super Bowl, of course). Finally, their franchise quarterbacks are linked not only because of their success but because of how different things might have been had the 2004 draft gone differently. Archie Manning, Eli’s father, made it clear before the draft that he did not want his son to play in San Diego. The Chargers had the 1st overall pick and intended to take Manning. The draft pool featured other good quarterbacks including Philip Rivers and Ben Roethlisberger, so when Eli Manning said he would sit out the first year if selected by the Chargers, San Diego got on the phone. The Giants answered and decided to make the trade that would shape the next 15+ years for 3 franchises. New York selected Philip Rivers with the 4th overall pick and traded him along with a bunch of draft picks to the Chargers for Eli Manning. The third piece of that puzzle was Ben Roethlisberger. The Giants and GM Ernie Acorsi really liked Roethlisberger and were content with trading their 4th overall pick to the Browns, getting something in return and then taking Big Ben with the 7th overall selection. However, when the Chargers called, Acorsi pulled the trigger and secured Manning as the franchise quarterback. Roethlisberger ended up falling to 11th overall where Pittsburgh snatched him up. Had the Giants decided they did not want to do the trade, Eli is in San Diego and the Chargers are stuck with a quarterback that doesn’t want to be there. Big Ben is in New York and Philip Rivers is somewhere else – it is tough to speculate where but we can be sure it wouldn’t have been with the Chargers, Giants or Steelers. It’s crazy to think back about how different things could have been. But that’s how it went down and now each team has had 8 and a half seasons with their quarterback. Eli has 2 rings and has evolved into the most clutch quarterback in the league. Roethlisberger has 2 rings and has become a reliable Top-10 quarterback who has the ability to extend the play like no other. Philip Rivers has just 3 playoff wins and has been average recently, leading the Chargers to a 21-19 record since the start of the 2010 season. As a Giants fan, I couldn’t be happier we made the trade and got Eli Manning. He is on his way to being the greatest quarterback in franchise history and is spoiling us as fans with his constant ability to win games in the 4th quarter. 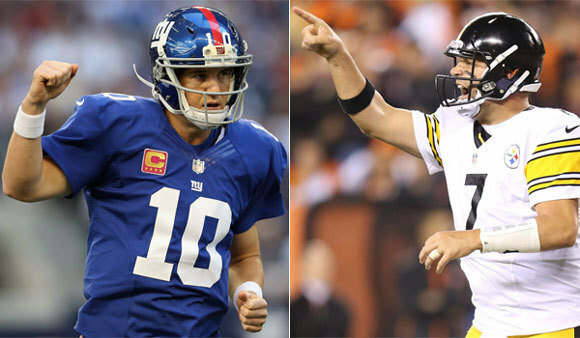 Roethlisberger is no slouch though and both Eli and Big Ben have become accustomed to winning. For just the third time, the two quarterbacks will go head to head on Sunday. Big Ben got the better of Eli at Giants Stadium in 2004, but Eli answered by winning at Heinz Field in 2008. Now it’s the rubber match at Met Life Stadium. The game would have been compelling enough for all of the reasons previously mentioned. However, 5 days before the game, Hurricane Sandy hit the tri-state area. The damage was devastating and now New York and New Jersey look to the Giants for a little distraction and a sense of normalcy. The Steelers are traveling to New Jersey this morning – the day of the game. The flooding at the hotel that Pittsburgh was scheduled to stay in forced the NFL to make an exception to its rule that teams must travel at least a day in advance of the game. Unselfishly, the Steelers agreed to stay in Pittsburgh until game day so that those in need of help can have places to stay. The circumstances surrounding today’s game are far from normal. Millions are still without power and around the corner from Met Life Stadium in Secaucus and East Rutherford, the lines for gas stretch for miles. Today’s game is an important one that will have playoff implications and features quarterbacks linked by their 2004 fates. More importantly, today’s game is a big one for the people of the tri-state area because it is a step in the rebuilding process. Maybe for a couple of hours on Sunday, people will return to being concerned about the outcome of a football game instead of constantly thinking about repairing the damage caused by Hurricane Sandy. Hi Bill, that’s an interesting question and a debate my co-workers and I often have. If you asked me this question last year I would have said no way. Jeter appeared to being showing signs of his age and missed 31 games in 2011 due to injury. But after Jeter’s resurgent 2012 (.316 AVG and .362 OBP, 15 HR and 58 RBI), I think it’s very possible he becomes MLB’s all-time hit leader before he retires. Once players hit age 35, most major leaguers regress and you begin to see a decline in their production (assuming they are not using performance enhancing drugs). At age 38, Jeter was the exception to this rule. He led the majors with 216 hits this season, his 2nd highest hit total in his career and his most in a season since 1999. It’s not a fluke either. He has been pretty consistent throughout his entire career, recording at least 150 hits in each of his 17 full seasons. Jeter currently has 3,304 career hits. Pete Rose had 3,372 career hits at the end of his age 38 season. Rose went on to play 7 more seasons (until he was 45) and he averaged 126 hits per season over those 7 years. What makes Rose’s record so remarkable is the longevity it required. Rose recorded 884 hits from the age of 39 to 45 (during his 18th to 24th seasons in the majors). So, not only did you have a player putting up Hall of Fame numbers in his “prime,” but he continued to have respectable numbers into his mid-40s. In order to surpass Rose, Jeter needs 953 hits. Let’s say he averages 150 hits per season for the remainder of his career (a modest assumption given he has averaged 184 per season to this point), he would need to play 6 and 1/3 more seasons to pass Rose. This means that Jeter would fittingly break his record at the same age (45) that Rose was when he set it. It’s going to come down to how long Jeter will be able to play. It’s safe to say the Yankees will never kick him out but I also get the impression that he is too proud to keep playing for the sake of an individual record if there is a younger, more productive alternative. His broken ankle in concerning but he should make a full recovery and return even hungrier to win and produce. To answer your question, I think Jeter will continue to produce into his 40s (with at least 150 hits per season), continue to be a vital part of the Yankees organization and eventually break Rose’s record. It’s going to be a lot of fun to watch as it all plays out over the next 5-7 years.